It is common knowledge that Ford Motor Company in Thailand are building a new factory on the Eastern Seaboard to produce the 2012 Focus, plus two other body styles based on the Focus floor pan. American reviews suggest you can forget what you knew about the previous Focus – the 2012 car is a monumental improvement. Available in four door sedan and hatchback body styles, the new Focus benefits from great exterior styling and a new interior with high-quality materials. There is also a new fuel efficient four cylinder engine, and new suspension that delivers both above average handling and a refined ride. The new Focus (for the American market at least) offers new technology, ranging from a rearview camera to Ford’s Automated Parking Assist, which gets you into a parking spot without the driver ever touching the steering wheel. There is also a new MyFord Touch system that largely does away with buttons and knobs in favor of a large center touchscreen and voice commands. The new Ford Focus is obviously a well-balanced and highly refined small car. 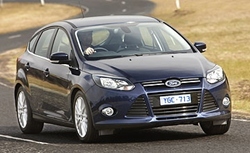 The 2012 Ford Focus offers the features and sophistication of a large car in a smaller, practical package. This sounds as though it really is one to wait for. Previous articleWhat did we learn from the Italian GP? Did Massa pull a sickie?